Secretary of State suggests to Abbas that 80, 000 Palestinian 'refugees' will 'return' to Israel in peace deal. U.S. Secretary of State John Kerry proposed to Palestinian Authority Chairman Mahmoud Abbas the “return” of 80, 000 Palestinian “refugees” to Israel, a well-informed Palestinian Authority (PA) official told Chinese news service Xinhua on Monday. The senior official of said on condition of anonymity that Kerry's proposal on the “return of Palestinian refugees” was part of the offer he presented to the Palestinian side in his latest bid to reach a framework peace agreement between Israel and the PA.
Kerry, who was visiting the region until Monday, had held talks on Friday and Saturday with Abbas in Ramallah. "Kerry's proposal on the return of refugees is the same proposal offered by former U.S. President Bill Clinton during Camp David peace talks held in the United States in 2000," said the official. 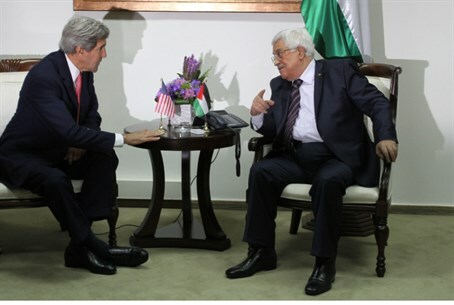 He added that during their meetings, Abbas wanted to increase the number of Arabs “returning” to Israel to 200,000, and the demand is still under discussion with Kerry. The PA claims that Arabs who fled Israel in the Independence War of 1948 are refugees to this day, as are all of their descendants. Israel has never accepted this wide definition of “refugees,” and has insisted that most Arabs fled the Land of Israel because they were told by overconfident Arab leaders to do so. The leaders expected a bloodbath in which Jews would be annihilated and assured the local Arabs that they would be able to return their homes when it was over. It has also noted that there were just as many Jewish refugees displaced from Arab countries at about the time of the War of Independence, many of whom were resettled in Israel – and argued that just as these refugees do not demand to be resettled in the Arab countries they fled, so shouldn't Arabs who fled Israel. Israel has always seen the PA demand for the “return” of “refugees” as a disguised attempt to flood Israel with Arabs who will change its demography in a way that challenges the Jewish majority. As for the issue of Jerusalem, the official said "Kerry's recent ideas focus on handing over parts of Jerusalem to the Palestinian National Authority and that Jordan will have the jurisdiction on holy sites and places in the city." However, Israel refuses to recognize East Jerusalem as the capital of the future Palestinian state, and insists that Jerusalem is the eternal capital of the state of Israel, according to the source. The Arab side also opposes Prime Minister Binyamin Netanyahu's demand that the PA recognize Israel as a Jewish state, the source said, adding that "gaps are still wide concerning the permanent status issues of the refugees, Jerusalem, borders, settlements and the Jewish state."